YANGON, Myanmar (AP) — A court in Myanmar sentenced two men to death on Friday for the killing of a prominent Muslim lawyer who was a close adviser to the country's leader, Aung San Suu Kyi. NAYPYITAW, Myanmar (AP) — Myanmar's parliament voted Tuesday to create a committee to propose amendments to the country's military-enacted constitution, which grants the armed forces the power to block any change. NAYPYITAW, Myanmar (AP) — Myanmar's military announced Friday that the Arakan Army, a Buddhist rebel group in Rakhine state, has been classified a terrorist organization after mounting a flurry of recent attacks. 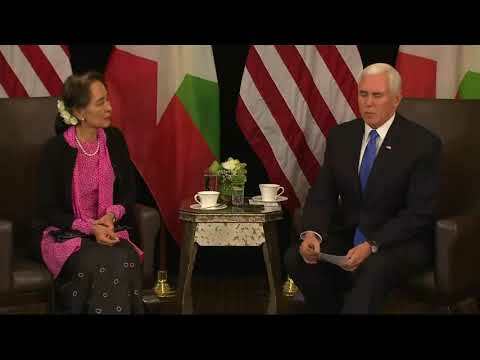 SINGAPORE (AP) — Myanmar leader Aung San Suu Kyi rebuffed criticism from U.S. Vice President Mike Pence and other leaders Wednesday over her government's treatment of its ethnic Rohingya Muslims. SINGAPORE (AP) — Malaysian Prime Minister Mahathir Mohamed sharply criticized Myanmar leader Aung San Suu Kyi on Tuesday for her handling of an ethnic crisis that led to mass killings and the exodus of more than 700,000 Rohingya Muslims from her country. NEW YORK (AP) — Amnesty International has withdrawn its highest honor from Myanmar's leader Aung San Suu Kyi in light of what it said was the Nobel Peace Prize laureate's "shameful betrayal of the values she once stood for." YANGON, Myanmar (AP) — Myanmar's ruling party led by Aung San Suu Kyi won just over half the seats in by-elections to fill 13 of the 1,171 seats in national, regional and state parliaments, according to complete preliminary results. YANGON, Myanmar (AP) — Voters in several parts of Myanmar went to the polls Saturday in 13 by-elections seen as a test of support for leader Aung San Suu Kyi and her ruling party. YANGON, Myanmar (AP) — Three detained journalists appeared in a Myanmar court on Wednesday to face charges filed against them by the Yangon regional government, which alleges a story they published was false. TOKYO (AP) — Japanese Prime Minister Shinzo Abe told Myanmar's leader Tuesday that a credible investigation into alleged human rights violations against Rohingya Muslims is key to resolving tensions in the country's Rakhine state. OTTAWA, Ontario (AP) — Canada's Parliament formally stripped Aung San Suu Kyi of her honorary Canadian citizenship on Tuesday for complicity in the atrocities committed against Myanmar's Rohingya people. 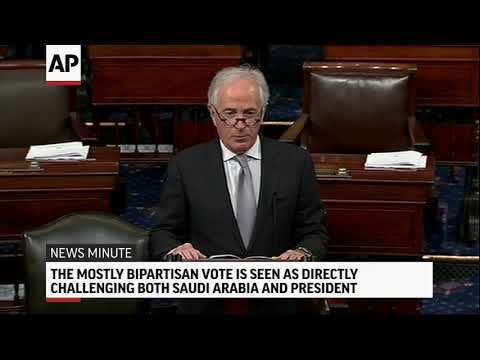 The Senate voted unanimously to strip Suu Kyi, Myanmar's civilian leader, of the symbolic honor bestowed on her in 2007. In a meeting in New York with a top aide to Myanmar's leader Aung San Suu Kyi, Pompeo also urged the government to immediately release two Reuters journalists who were jailed for reporting on violence in the country's northern Rakhine State, according to the State Department. WASHINGTON (AP) — More than 80 U.S. lawmakers have urged the Trump administration to step up efforts to win the release of two Reuters journalists jailed in Myanmar for reporting about massacres against Rohingya (ROH'-hihn-jah) Muslims. HANOI, Vietnam (AP) — In the face of global condemnation, Myanmar's leader and Nobel Peace Prize laureate Aung San Suu Kyi on Thursday said that the handling of Rohingya Muslims, 700,000 of whom have fled to Bangladesh amid a brutal military campaign, could have been better, but still defended security forces from charges of civilian atrocities. BANGKOK (AP) — Myanmar's government looks as if it's under siege from an international community concerned about the condition of its nascent democracy, with widespread calls for a genocide tribunal to hold its military to account for the brutal treatment of its Muslim Rohingya minority. SINGAPORE (AP) — Myanmar leader Aung San Suu Kyi on Tuesday defended her government's actions in Rakhine state, where about 700,000 Rohingya Muslims fled from a brutal counterinsurgency campaign to neighboring Bangladesh. She said terrorism, not social discrimination or inequality, triggered the crisis. Suu Kyi made the comments in a lecture in Singapore in which she reviewed her two years in power. NAYPYITAW, Myanmar (AP) — Members of a commission established by Myanmar's government to investigate human rights violations in western Rakhine state, where 700,000 members of the Muslim Rohingya minority fled brutal army operations, addressed critics Thursday with a pledge to be impartial. The Independent Commission of Enquiry held its first formal meeting Thursday in the capital, Naypyitaw, a day after holding talks with the country's leader, State Counsellor Aung San Suu Kyi. YANGON, Myanmar (AP) — Myanmar sharply rejected an attempt by the International Criminal Court to consider the country's culpability for activities that caused 700,000 minority Rohingya Muslims to flee to Bangladesh for safety last year. The office of the nation's leader, Aung San Suu Kyi, said in a statement posted online Thursday that the court in the Netherlands has no jurisdiction over Myanmar because it is not a member state. YANGON, Myanmar (AP) — Myanmar's government should expedite restitution for past illegal confiscations of land, an international human rights group said Tuesday, detailing how previous land seizures there are still harming farmers under the civilian-led government of Aung San Suu Kyi. NAYPYITAW, Myanmar (AP) — Myanmar's leader Aung San Suu Kyi and the country's military commander on Wednesday opened a major conference with representatives of ethnic minority groups to try to move toward a lasting peace after seven decades of strained relations and armed conflict. YANGON, Myanmar (AP) — A social media account run by the office of Myanmar leader Aung San Suu Kyi quotes her as saying that "hate narratives from outside the country" have fueled tensions between Muslim Rohingya and Buddhist Rakhine communities in the country's west. YANGON, Myanmar (AP) — A U.N. expert on the impact of conflict on children expressed concern Tuesday over a lack of access to Myanmar's Rakhine state, where army-led violence has prompted about 700,000 Rohingya Muslims to flee to neighboring Bangladesh since last August. NAYPYITAW, Myanmar (AP) — Ambassadors from the U.N. Security Council probing Myanmar's crisis over its ethnic Rohingya Muslim minority met Monday with the country's leader and military chief after visiting Bangladesh, where about 700,000 Rohingya who fled military-led violence live in refugee camps. Why is democracy stalled in Myanmar? Nobel Peace Prize laureate Aung San Suu Kyi has served as state counsellor of Myanmar since 2016. Although she is essentially prime minister, the country’s struggle to build a democracy seems to have stalled. SINGAPORE (AP) — A board appointed by Myanmar leader Aung San Suu Kyi to offer recommendations on the crisis in Rakhine state, from which hundreds of thousands of Muslim Rohingya have fled state violence, on Tuesday applauded Bangladesh's agreement to let a Myanmar state minister visit border camps where the refugees live. NAYPYITAW, Myanmar (AP) — A longtime Aung San Suu Kyi loyalist vowed to prioritize the rule of law, peace and reconciliation Friday after being sworn in as the country's new president, who will continue his predecessor's deference to her as the de facto national leader. NAYPYITAW, Myanmar (AP) — Myanmar's parliament on Wednesday elected as the country's new president a longtime loyalist of Aung San Suu Kyi who is expected to carry on his predecessor's practice of deferring to her as her nation's de facto leader. YANGON, Myanmar (AP) — Myanmar's parliament took a first step Friday in selecting a replacement for President Htin Kyaw, who retired this week with ill health, by filling the empty seat of one of the country's three vice presidents. YANGON, Myanmar (AP) — Myanmar's president, a close friend of leader Aung San Suu Kyi, said Wednesday that he was retiring, a move that puts a representative of the country's already powerful military at least temporarily in a position of executive power. CANBERRA, Australia (AP) — Myanmar leader Aung San Suu Kyi was feted in Australia with a military honor guard and 19-gun salute Monday as part of a state visit that has provoked protests over her response to her country's violent campaign against Rohingya Muslims. WASHINGTON (AP) — The United States Holocaust Museum is revoking a major human rights award given to Nobel Peace laureate Aung San Suu Kyi, the country's civilian leader, saying she has failed to respond adequately to the mass killings of Myanmar's Muslim Rohingya minority. YANGON, Myanmar (AP) — About 200 people marched in Myanmar's biggest city on Monday to protest government plans to amend a law governing public demonstrations to make it easier to charge participants with crimes and increase penalties for violations. DHAKA, Bangladesh (AP) — Three peace prize laureates who met with Rohingya Muslims in sprawling refugee camps accused fellow Nobel recipient Aung San Suu Kyi and Myanmar's military of committing genocide in the deadly violence that forced hundreds of thousands to flee into Bangladesh. Suu Kyi does not oversee her country's military or its security operations that set off the refugee exodus, but the laureates said as Myanmar's leader, she cannot avoid responsibility. BANGKOK (AP) — When five Myanmar journalists were sentenced to decadelong prison terms for reporting the alleged existence of a military-run chemical weapons factory in Myanmar a few years ago, Aung San Suu Kyi — then an opposition lawmaker — condemned the harsh punishments as "very excessive." BANGKOK (AP) — Two ethnic rebel groups on Tuesday joined Myanmar's long-delayed peace process, a small step forward in ending decades of civil strife. Other major groups continue to keep their distance. BANGKOK (AP) — British Foreign Secretary Boris Johnson met Myanmar leader Aung San Suu Kyi on Sunday to discuss the Southeast Asian nation's Muslim ethnic Rohingya minority and how almost 700,000 of them can be repatriated safely after fleeing to Bangladesh to escape violence perpetrated largely by Myanmar's military. YANGON, Myanmar (AP) — A crude petrol bomb was tossed Thursday morning into the residential compound of Myanmar leader Aung San Suu Kyi, but she was not at home and damage was minor, officials said. Suu Kyi was in the capital Naypyitaw when the incident took place, government spokesman Zaw Htay said.